Public school districts in New York state have recently experienced numerous instances of financial scandals. These scandals have been unprecedented in both the number and diversity of financial malfeasance. Furthermore, such scandals result in the diversion of hard-earned property taxpayers’ money from their proper use in school instruction to improper and illegal purposes that do not further the school districts’ essential mission of educating New York children. Therefore, the legislature finds that it is necessary to establish a new, independent state agency charged with the function of investigating allegations of corruption, financial improprieties, unethical conduct, misconduct or other criminal conduct within public school districts outside of New York city. In addition, the legislature further finds that the current laws must be amended to incorporate school district financial safeguards and establish sanctions for violations of school district finance laws. Tuesday, March 18, at 7:00 PM at 11 New Hempstead Rd in New City. It is important to note that the successes we have had in protecting the taxpayers interests have been achieved through investigations by private citizens who then report these findings to the Commissioner. A State Agency to conduct investigations would be a welcome addition to our efforts. “East Ramapo” is a dramatic series of monologues and conversations of individuals directly affected by the situation in the East Ramapo Central School District. These include high school students from both public and private schools, administrators and community activists. Several of the actors perform in their own voices. The goal of the play is to provide an artistic opportunity for individuals with widely divergent beliefs and cultures to recognize and hear each other in a safe setting. East Ramapo was written by Mark Judelson. Sunday, March 23, 2:00 p.m.
Sunday, April 6, 1:30 p.m.
Monday, April 28, 7:30 p.m.
Sunday, May 4, 2:00 p.m.
Funding for East Ramapo has been made possible by a grant from the Puffin Foundation. Children in the East Ramapo School District are being deprived of many of the most basic elements of education. The district has been gutted in a devastating and careless way by those on the school board. This can not be allowed to go on. There are many people working to try to restore education to the once prized school district and many trying to offer these kids a bit of hope. Supporting the class action suit is a powerful way to help. 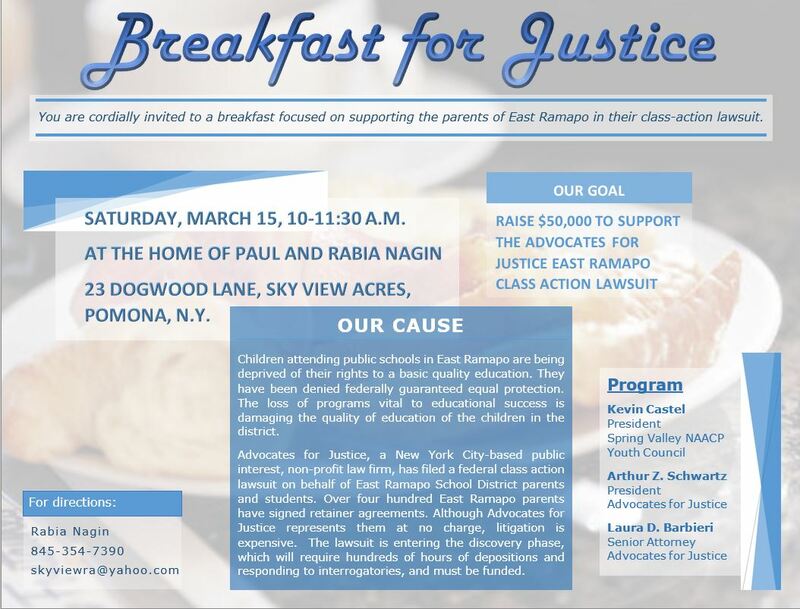 SATURDAY, MARCH 15, 10-11:30 A.M.
23 DOGWOOD LANE, POMONA, N.Y. If you are unable to attend, please consider donating at http://poweroften.us/donate/ All donations are tax deductible.